Question: If I have no contacts for a client, Translation Office crashes every time I press 'Clone' button on 'Contacts' tab. Answer: Sorry for this inconvenience. The situation will be fixed in future releases. Please note that 'Clone' button on the 'Contacts' tab should be used to clone the existing contact which is currently highlighted only. If you want to clone client's contacts, please highlight the Client name on 'Main' tab, then (without passing to Contacts tab) press 'Clone'. You will be prompted to choose what fields should Translation Office clone. 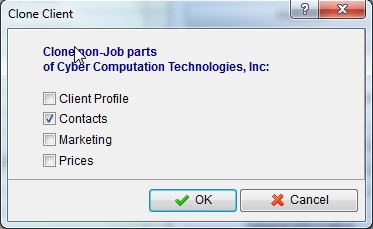 Please set 'Contacts' checkbox and press 'Ok' button. New client will be created. Contacts linked to this client will be similar the the contacts of the client you've just cloned.